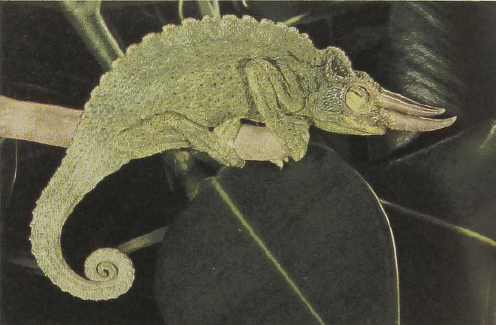 Certain East African chameleons have horns on their snout reminding one of the much larger fossil reptiles known as ceratopsians. 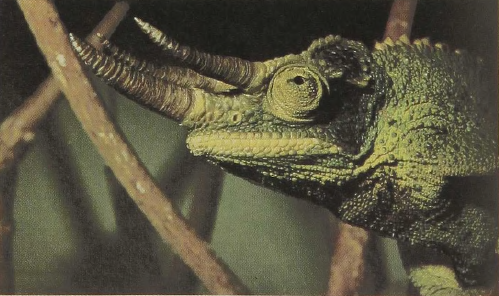 Some species have horns in both sexes; in others, horns are restricted to males. It was once argued that such horns, flaps, and ridges lacked a function, but we now know that they serve as species-recognition signals during courtship displays. Only 4 inches long, the males of this East African chameleon use their horns in fighting: they meet on a narrow branch and lock horns until the stronger dislodges his opponent.